Wow, Java! The 60th edition! I don't know how you continue your marvelous HOPS with all you have going on, but I certainly appreciate it! Sorry about that. I added the pink shirt to http://teresworld.blogspot.com. Linking up for some Friday fun. Y'all come by my place for a visit! 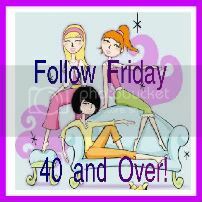 Hi...new here to the Follow Friday...and, ahem....WAY over 40. Pushin' retirement age...no, wait. I AM retirement age. and the linked button is at the bottom of my blog now with all the other "follower" buttons. Hope that's okay. Thanks for hosting. Now if I may ask a favor, please stop by & check out my 2 CD give-away and help me with the statistics to bring to one of the top agents in LA. I’m bring him all my blog information on how I advertise, all the CD’s that I have cut with Lone Star & pictures. Thanks & pass the word. Thanks for hosting! Just got back from the gyn and yes, I am still getting older, and that is what my body is trying to tell me in some less than kind ways! Glad there is somewhere to visit where 40 is required! I was told by a few people that my link wasn't working over here, so I resigned in & it's working now. Thanks! Hope you don't mind, and have a great weekend. Hey Java, thanks again for hosting. Have a great weekend! Thanks for the link up. Happy Friday! Thanks for Hosting and Happy Friday!!! I'm back to Friday Follow! Yay! Come see me!